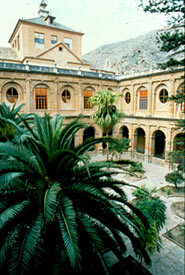 The building, originally, was a convent with a college that later became a University. The south facade has a marked horizontal appearance, and presents three access doors, to the church, to the convent and to the university. The first one is Juan de Inglés and has two bodies with Corinthian columns, the second consists of three bodies in which three classic orders take place, whilst the third is a great baroque facade from the beginning of the XVIII century constructed by Pedro Juan Codoñer. It is formed by two bodies and is finished off by a sculptural allegoric figure. Times: martes - viernes: 9.30 a 13.30 y de 16.00 a 19.00 h. (11.00-11.30 no visitas) grupos visita hasta las 13.00 h. Sábado: 10.00 a 14.00 y de 16.00 a 19.00 h. Domingos y festivos: 10.00 a 14.00 h.